(by Bojan Pancevski, The Wall Street Journal) BERLIN—German Chancellor Angela Merkel has [agreed] to open up Germany to U.S. gas, a key concession to President Trump as he tries to loosen Russia’s grip on Europe’s largest energy market. [Earlier] this month, the chancellor told a small group of lawmakers her government had decided to co-finance the construction of a $576 million liquefied natural gas (LNG) shipping terminal in northern Germany, according to people familiar with the meeting, giving a crucial nudge to a project that had failed to get off the ground for years in a country that gets most of its gas cheaply from Russia. President Trump has intensively lobbied Europe to buy significant amounts of LNG (liquefied natural gas) as part of his campaign to rewrite the terms of trade relations. German and U.S. officials said Berlin hoped embracing U.S. gas might help solve a protracted trade dispute and possibly even defuse threats by Washington to sanction Nord Stream 2, an unbuilt German-Russian gas pipeline that would double Russia’s existing gas export capacity to Germany. 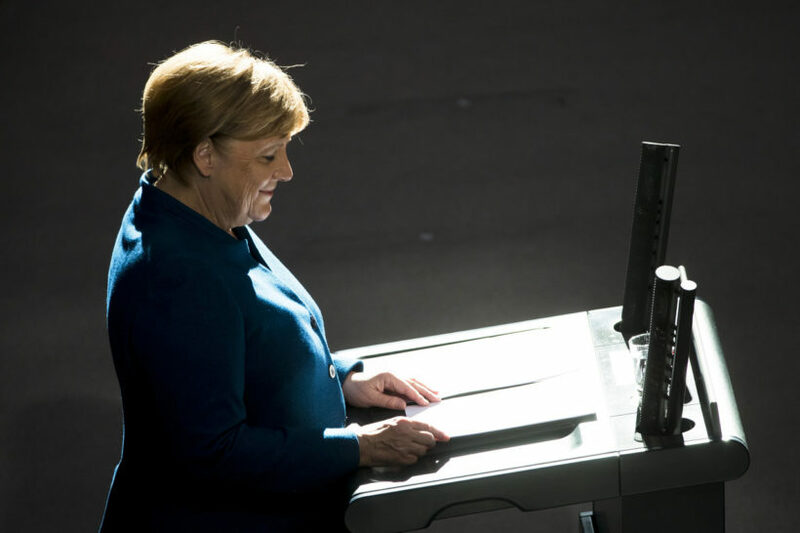 As she briefed lawmakers from Germany’s northern coastal region, Mrs. Merkel didn’t describe her change of mind as a defeat but as a “strategic” decision that could pay off in the longer term, according to the people. Experts agree that opening up its energy market won’t have an immediate economic benefit for Germany, but it could eventually help the country diversify. For years, plans to build an LNG terminal by several groups were stalled because there was no government support that would make such a project economical. On Oct.16, less than a week after the meeting, an international consortium filed its first official bid for state support for a terminal in the northern town of Stade, near Hamburg. A ceremony took place on a terrace overlooking Berlin’s landmark Brandenburg Gate in the presence of senior politicians and U.S. Ambassador Richard A. Grenell, …the president’s main conduit in his lobbying effort. “We’re creating jobs and we’re also deepening the trans-Atlantic relationship. The U.S. is totally committed to bringing U.S. LNG to Europe and to Germany,” Ambassador Grenell said. During her conversation with local lawmakers, Mrs. Merkel said she didn’t think an LNG terminal would break even for at least a decade and would require long-term government support. A German government spokesman said the decision to fund a terminal was made in accordance with commercial interests and not U.S. pressure. One U.S. argument making headway in Germany is that buying U.S. LNG would improve Germany’s energy security by making it less reliant on Moscow. Russia accounts for over 50% of German gas imports, with the rest primarily from Norway and the Netherlands, according to BP’s 2018 Statistical Review of World Energy. Mr. Trump has repeatedly said Berlin was “captive” to Moscow and would become dependent on Russian exports. Published at The Wall Street Journal on October 22. Reprinted here for educational purposes only. May not be reproduced on other websites without permission from The Wall Street Journal. b) What is the significance of this announcement for the U.S.? c) Why is U.S. LNG 20% more expensive than Russian gas? d) What argument did the Trump administration use when lobbying Germany to buy the more expensive LNG from the U.S.? e) Mrs. Merkel said she didn’t think an LNG terminal would break even for at least a decade and would require long-term government support. A German government spokesman said the decision to fund a terminal was made in accordance with commercial interests and not U.S. pressure. What do you think – did the U.S. have anything to do with Germany’s decision? Explain your answer.